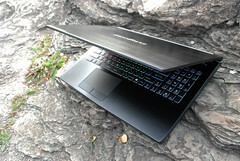 Configure the laptop exactly the way you want it, request a quote, and then name your discount. The promotion will be for this weekend only and it will apply to all Eurocom laptops including gaming, workstations, Enterprise-class laptops, and mobile servers. In an interesting move, Eurocom's Black Friday sale will not include fixed discounts. Instead, individual buyers can request a discount at his or her own discretion and a sales representative from the reseller can then choose to counter the offer or honor it. The unusual approach will likely attract more eyes than simply slashing a few hundred dollars off each configuration. It's also a unique way for Eurocom to boast about its very wide customization options since its laptops tend to have removable storage, RAM, CPU, and GPU components. Users can customize a Eurocom laptop through the website, such as the Sky X9C or Tornado F5, and then submit how much of a discount they would like to receive before committing to the purchase. There will no doubt be some trolls who will request absurd discount rates. For everyone else, however, it's a good opportunity to get a high-power system for a fair price. The promotion will be in effect from November 23rd to the 26th only. Eurocom launches a customized Black Friday Special Promotion so customers can customize not only their laptops, but also the discounts they would like to receive. Configure the laptop of your dreams at a customized Black Friday pricing with Eurocom’s line of GPU, CPU and User-upgradeable high performance laptops! Eurocom has a long tradition of providing power users and technology lovers GPU and CPU-upgradeable laptops that are highly user-customizable. Extending that tradition, this Black Friday 2018, Eurocom takes customization to another level. From November 23rd till the 26th only, a special promotion will be available through Eurocom, where users can choose ANY of Eurocom’s wide array of high end laptops across the different categories of Mobile Supercomputers, Gaming laptops, Ultraportable, Mobile Workstations, Enterprise-class laptops, and Mobile Servers. Users will be able to configure their customized laptop computer based on their individual preferences and submit a request for Special Black Friday discount to Eurocom. The Eurocom Sales team will then review the request and offer a customized discount, so the user would be able to buy the laptop of their dreams at a specialized pricing. We might just make your dreams come true! Customers can choose from 15 different Eurocom models , with different LCD panels ranging from 14", 15.6" and 17.3" LCD panel sizes, different resolutions (FHD, QHD, UHD), various frequencies ( 144Hz, 120Hz or 60Hz). In terms of processors and graphics cards, Eurocom offers a wide selection of Intel CPU’s: from next generation i9 9900k 8cores/16threads to Xeon-based CPU’s, as well as a variety of NVIDIA-powered GPU’s like dual GTX 1080 in SLI mode, or a Quadro P5200 GPU, depending on the user’s specific requirements. Eurocom also provides power users up to 128 GB of DDR4 RAM in their top-of-the line laptops like the Sky “C” Series systems and up to 22TB of storage space in RAID 0/1/5/10 configurations. Compatible with major operating systems like Windows 10, Windows Server 2016 Data Center Edition, VMWare and Linux, to name a few, Eurocom supercomputer-class systems pack incredible power in a portable, laptop form factor. A Eurocom system is the perfect tool for users who desire to perform high-level tasks and run power-hungry programs for many years to come. With this personalized pricing promotion, Eurocom aims to provide a new innovative way to work with customers across all industries and give a personalized approach in obtaining some of the most powerful systems available today. Step 1) Visit the Eurocom website, choose and configure a laptop system to receive an electronic quote. Step 2) Make a note on the E-quote indicating the exact discounted percentage you would like to receive. Step 3) Wait for confirmation / approval of your discount request, proceed with payment and receive your Eurocom system within days!